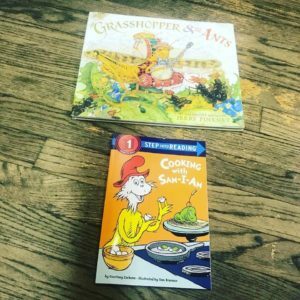 Two Book Friday time! First we have a very beautiful edition of The Grasshopper and The Ants which is one of my very favorite stories. Also we have a Step Into Reading book as the little one is getting closer and closer to reading on her own, Cooking With Sam-I-Am, a sequel to the classic Green Eggs and Ham.